For a new generation of abstract painters, the process of making an artwork often becomes an indispensable part of showing the work as well. Within the gallery/art fair/website complex, paintings can be accompanied by interesting back-stories, or at least a series of words – such as ‘discovery’, ‘exploration’, or ‘deconstruction’ – which keep the figure of the bold and exciting artist close to the painting they’ve made. In the case of Christian Rosa, however, it seems more than reasonable to draw attention to his process in this way, because it is vividly manifest in his work. In his latest show, ‘Put your Eye in your Mouth’ at White Cube Mason’s Yard, abstract pictorial characters interact freely within large canvases. The process they reveal is similar to jazz improvisation: composition is discarded and each new note (or element in the painting) is a response to what has come before it, and likewise must be accommodated by what follows it. There are no mistakes, only adjustments and problems to solve. Filling the canvas is not a means to an end but an end in itself. The result is a sense of kinetic energy, and of things unfolding. Kathy Grayson has aptly compared Rosa’s work to a Rube Goldberg machine, and you are indeed invited to follow an imaginary ball as it twists through coiled pencil lines, bounces between dashes of electrical tape, and drops from boxes to be deposited in pools of impasto oil paint. When you come to a painting, there is an interesting moment when everything is in flux, and your eye can dance along a range of different sequences and relationships. The canvas is an imaginative space where the restrictions of logic and familiarity are briefly suspended. The paintings can unfold in the way due to the suggestive nature of Rosa’s pictorial language, which, though abstract, approaches meaning or even symbolism. The artist’s trick is to avoid representation, yet come close enough to it to activate the viewer’s instinct to decipher an image. Thus is, of course, an old modernist recipe, used to great effect by abstract artists such as Paul Klee, Antoni Tàpies and Cy Twombly (on whose influence Rosa is outspoken). The essential element is that of drawing – a hand rendered quality that invokes a human voice trying, on some level, to communicate. 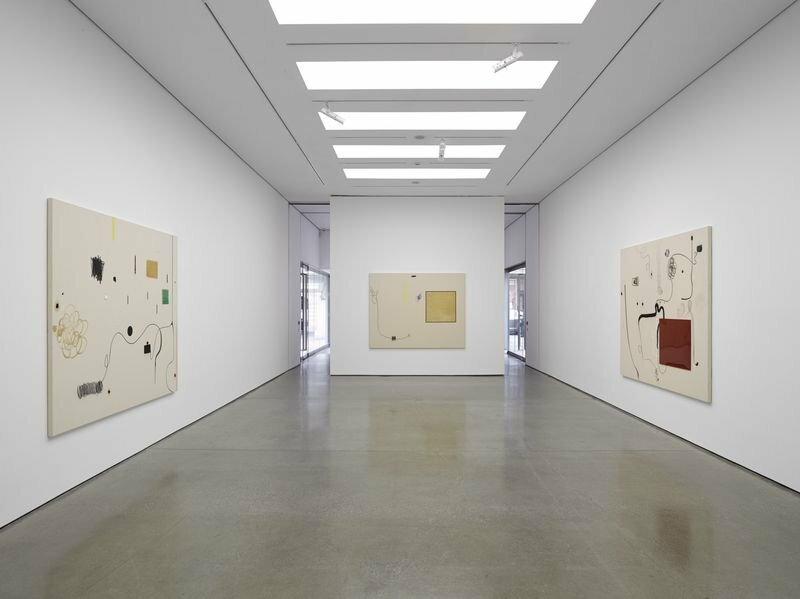 But most critics have been weary of comparing Rosa and his contemporaries – such Rebecca Morris, Joe Bradley and David Ostrowski – to this older abstract tradition, known for its conviction and spiritual depth. Advocates of the contemporary works emphasise their playfulness and improvisation, with terms like ‘casualism’ and ‘provisional painting.’ But this has inevitably invited more caustic labels such as ‘slacker abstraction’ or ‘zombie formalism’. In a piece for the March issue of Frieze, David Geers accuses Rosa of outright nostalgia. Latent in these tags, I think, is the criticism that painters like Rosa are borrowing the fashions of the past without demonstrating any of that daring and commitment which originally characterised them. What this means in the language of contemporary art is that the work is not subversive enough; it is too consumer friendly, and thus devoid of substance. But subversion is not Rosa’s aim, and it must be said that the energy and curiosity of his work, though fleeting, leaves this criteria itself feeling nostalgic and more than a little institutionalised. Indeed, there is an element of the famous Whistler v. Ruskin dispute in these criticisms of current abstract painters – a sense of resentment towards the market for celebrating work that has not taken long enough to paint. Moreover, Rosa has updated pictorial abstraction. One of his most consistent elements is, unmistakably, the screen – screens everywhere, in different sizes, colours and textures. The way that elements float on his canvases implies the moveability of icons on a desktop, and their arrangement in front of and behind each other mimics the indeterminate digital space, at once flat and infinitely deep. There is even room, in his exploration of the way autonomous objects can connect, to interpret a more profound evocation of modern life. At the exhibition opening, all this was rather epitomised by Rosa himself, absent-mindedly wandering around the room looking at his phone. Process and its inherent sense of personality are prominent in Rosa’s work, and this is just the art you might expect from a skater in a Where’s Wally hat who paints with his friends in a Los Angeles warehouse, and dispenses corny phrases like ‘New York is dead,’ and ‘I never chose painting, it chose me.’ Both he and his work embody an unassuming, satisfied and nonchalant strand of creative culture. Whether you like or loathe him probably reflects how you feel about that culture. ‘Christian Rosa: Put your Eye in your Mouth’ is at White Cube Mason’s Yard, London, until 23 May.